Greater Manchester is seeking your views on the powers that the City Region needs to drive forward its ambitious programme of growth and reform. We’re living through the most exciting changes to how England is governed for generations. Greater Manchester has led the way on ‘devolution agreements’ that move decision-making on crucial public services like local transport, housing, health and skills training closer to local people. Please tell us whether you agree or disagree with the powers proposed for the GMCA and let us know why you agree or disagree. The closing date for this consultation is 15 August 2016. 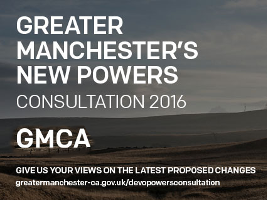 Go to www.greatermanchester-ca.gov.uk/devopowersconsultation for more information about devolution powers and the consultation form.